"This is a very simple but elegant dessert. It must be made at least 8 hrs ahead of time, but oh so worth it. Serve with vanilla ice cream. Garnish with edible flowers or mint leaves. Simply elegant." Beat egg whites in clean, dry bowl with electric mixer for 2 minutes. Beat in salt and cream of tartar. Continue beating and pour in sugar, a few tablespoons at a time, until mixture is glossy and stiff peaks form. Fold in vanilla. Place in greased pie plate or spoon or pipe onto parchment-lined baking sheets. Place in preheated oven and turn oven off. Leave meringue in unopened oven 8 hours or overnight. 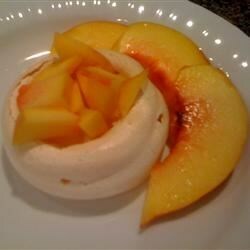 To serve, place meringue on serving platter and arrange peaches on top. This dessert was very attractive, but I thought the meringue was far too sweet, I've had meringue shells before that would be better and use much less sugar.